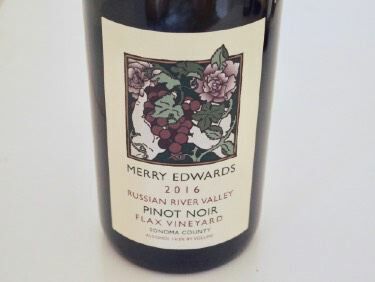 Merry Edwards, the "Queen of Pinot," has been crafting Pinot Noir in California dating back to the early 1970s when she had her start at Mt Eden in the Santa Cruz Mountains. She was largely responsible for the emergence and national prominence of Matanzas Creek. Subsequently, she had her own label, Merry Vintners, which failed financially and had a stint at Laurier. Along the way she has done important Pinot Noir clonal research and is responsible for the Mt Eden clone (UCD 37). When Merry entered graduate school at the University of California at Davis after graduating from University of California at Berkeley, she found that the university did not fully back her entry into an industry and profession that was supposed to be open to all. She took exception to the network of favoritism within the Department of Viticulture and Enology that did not give all students equal access to employment opportunities. She was able to convince the department and school administration that unequal treatment should not continue. Her master's research made waves. She created a method for analyzing lead in wine and did a broad study of California vintages. She found that this toxin migrated from lead capsules into wine. Her results were suppressed for an entire year along with the ability to complete her thesis. The repercussion was the termination of lead capsule use, an industry-changing event. The most exciting and absorbing chapter of Merry's professional career is her present passion. 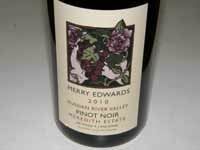 In 1997 she co-founded a business venture with husband and partner Ken Coopersmith allowing her to produce Merry Edwards Wines from select Pinot Noir grapes in the Russian River Valley and Sonoma Coast, including, for the first time, her own vineyards: Meredith Estate (planted in 1998), Coopersmith (planted in 2001), along with long-term leases for Georganne, Warren's Hill, Flax, Richaven and Maefield. “ I have always wanted to make wine from the ground up." Today, after many years of being a guest in other wineries, she owns the customized Merry Edwards Winery constructed in 2006 and, located at the Coopersmith Vineyard. Reception was expanded in 2010 and a guest house and barn have been added. The impressive Pinot Noir lineup: Olivet Lane Vineyard, Coopersmith Vineyard, Meredith Estate Vineyard, Flax Vineyard, Klopp Ranch Vineyard, Tobias Glen Vineyard. Don't forget the Sauvignon Blanc - it is the best made in California. 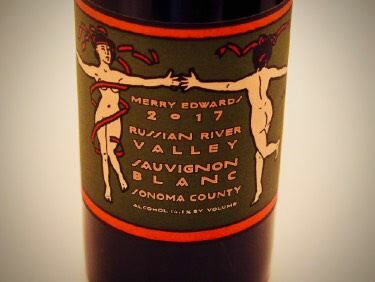 Merry Edwards wines are consistently among the top sellers in US restaurants. The Merry Edwards winery and tasting room are open by appointment.